Calling all Florida-based bloggers -- be you a blogger about politics, parenting, kids, theme parks, Florida life, food, beaches, traveling, pets, health, beauty, and more! Monday is the day! 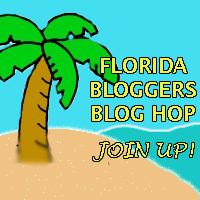 Time to join the Florida Blogger Blog Hop. You don't have to write a special post, or even a post with a Florida theme to take part in the Blog Hop. Whatever post you normally plan to do for Monday, just add the code to that post. The purpose of the blog hop is for other Florida-based bloggers and their followers to learn about other Florida-based blogs. So act just act naturally. Look at this as a way to maybe increase your visibility in your home state. The Blog Hop will open Monday at midnight and close Tuesday at 11:59 p.m. You'll be able to get the code there. You will be able to find it on this post! Have fun! This is a GREAT idea! I'm just curious because in your original post it says "Central Florida Bloggers"...and I am in South Florida...so can we still join? Is it open to all of Florida now? Yep! We decided to make it a whole Florida hop! That's awesome, Christie! Looking forward to it! Hi Christie, I just discovered this. I run a Monday blog hop too, so I guess we'll have to play back and forth--LOL. Good luck! Oh no! lol! We'll make it work. This will be fun! I like blog hops and I'm in Florida!